The writers reading today during the third and final evening of the Malta Mediterranean Literature Festival at Fort St Elmo in Valletta are Welsh poet and performer Zoë Skoulding; internationally-acclaimed Maltese poet and novelist Immanuel Mifsud; Latvian poet Arvis Viguls; and the celebrated Palestinian writer Mourid Barghouti, author of poetry and prose, including the bestselling memoir I Saw Ramallah, who will be interviewed by Norbert Bugeja. Before the readings, the festival is hosting a pre-festival event called Speed Dating: Face to face with Literatures in Europe at 7pm, in which representatives from European literary organisations and institutions have five minutes to share information about opportunities in the field of literature and publishing with those who visit their stand. The representatives from Literary Europe Live taking part in this session are Alexandra Büchler and Siân Williams from Literature Across Frontiers and Literary Europe Live; Mika Buljević from Kulturtreger Booksa, Zagreb; Juta Pīrāga from the International Writers and Translators House, Latvia; and Judit Böröcz from the Petöfi Literary Museum, Budapest. This festival evening also features the screening of Off the Trail (2015) by Jacob Cartwright and Nick Jordan, winner of the 2016 Zebra Prize for the Best Poetry Film, donated by the Haus für Poesie of Berlin. The film is based on Gary Snyder’s poem Endless Streams and Mountains and will be introduced by Noel Tanti. Live music will be provided by Heart of Darkness duo John Bartolo on drums and Jimmy Bartolo on guitar. 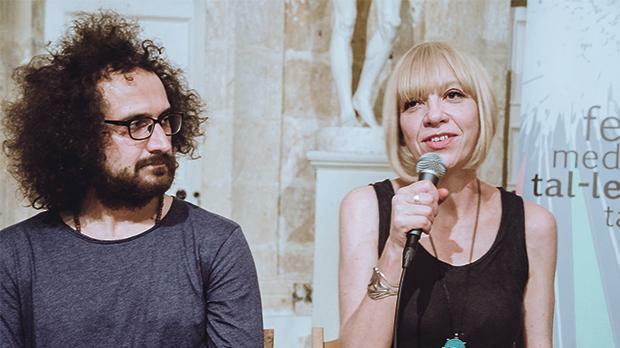 The 2017 edition of the Malta Mediterranean Literature Festival and the Malta LAF translation workshop are part of a cultural partnership agreement with Arts Council Malta and the LeuL platform coordinated by Literature Across Frontiers. Support is provided by the Valletta 2018 Foundation, Heritage Malta, Għaqda tal-Malti – Università, the volunteers of Tal-Kultura and Studio Solipsis. The MMLF is the recipient of the EFFE, Europe for Festivals, Festivals for Europe label. The festival runs at Fort St Elmo in Valletta at 8pm. Entrance is free. For more information, visit www.inizjamedmalta.wordpress.com.